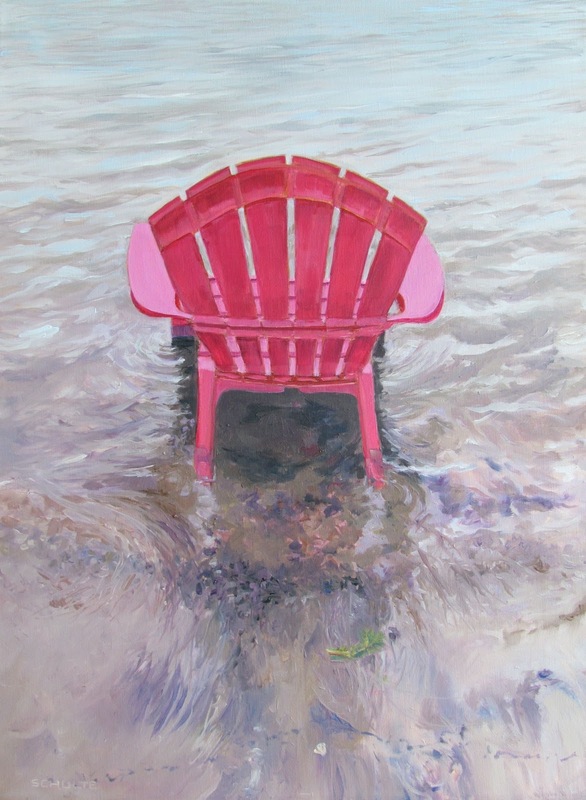 One of the most powerful pieces in the original exhibition, you can almost feel the water lapping around the feet of the pink chair. This painting took a lot of preparation in laying it out. 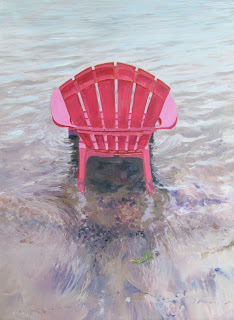 The ratio of water to chair seemed incredibly important to me. I measured canvases until I found the perfectly proportioned one I used. Later, considering cropping it, I found that my care was wise. The piece lost all its power when the water to chair ratio was different. The painting was done from a photo taken at the end of an awesome boat ride on a pontoon boat at Desert Lake Resort, the kind of dreamy, all the time in the world kind of day. My cousin Bill drove the boat, his wife Marnie made the lunch, and "Mom" held the towels. We looked for loons, picnicked and swam in a cove off the boat. It was a perfect day. The title of the piece came to me out of the blue and for a while I have wondered what it meant. I thought that perhaps it was because both Mom and I have suffered from painful feet, which would have loved having the cool water wash over them. But a gift of understanding came from Barb Bodengraven, a writer, who said that the chairs arms were "open to whatever treasures the incoming tide will bring". Yes. That's it! My mother had experienced the joys of the day with us and took that same openness to all of the events her life would offer. She just jumped right in at every stage of life.